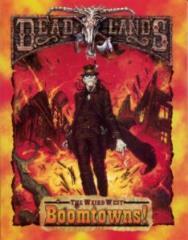 This boxed set comes with everything you need to create boomtowns in Deadlands: The Weird West in a flash. It includes a 64-page adventure book featuring four Weird Western towns, 16 double-sided, extra-thick, town tiles, and a free copy of Marshal's Log! Written by John Goff, Tony Lee, Lisa Smedman, and Joe Wolf; cover by Paolo Parente.